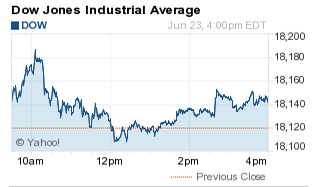 The DJIA today added 24 points. The markets reversed early losses after Federal Reserve Governor Jerome Powell said today that the U.S. economy may be prepared for two interest-rate hikes in 2015. Today, the Nasdaq Composite Index finished at a new record close, while the S&P 500 is now a few points off from its all-time record. The S&P 500 Volatility Index (VIX), the market's fear gauge, slipped 4.9% today. Biggest Downers: This afternoon, Microsoft Corp. (Nasdaq: MSFT) dipped 0.7%, the largest weight on the Nasdaq and the S&P. Today's largest decliner for the Dow Jones was Boeing Co. (NYSE: BA), which fell 0.84%. What Oil Did: WTI oil pricesadded 1.3%, topping $61 a barrel today as U.S. inventory data suggested strong demand for domestic gasoline. Brent oil added nearly 2.1% to hit $64.69 per barrel as worries that a nuclear deal between Iran and the West could face delays, which would negatively affect the nation's oil exports. Housing Hopes: This morning, the U.S. Commerce Department announced that sales of new homes jumped 2.2% to hit 546,000, a seven-year high. That number is higher than the 522,000 anticipated by economists. Shares of homebuilders Toll Brothers Inc. (NYSE: TOL), Hovnanian Enterprises Inc. (NYSE: HOV), and Comstock Holding Companies Inc. (Nasdaq: CHCI) were all in positive territory during today's session. Stocks to Watch No. 1, GDOT: Shares of Green Dot Corp.(Nasdaq: GDOT) gained more than 40% today on news that the company has won a contract with Wal-Mart Stores Inc. (NYSE: WMT) to manage the retail giant's MoneyCard debit program for another five years. The news came on the same day that Green Dot's board authorized a $150 million buyback program. Stocks to Watch No. 2, SONC: Shares of Sonic Corp. (Nasdaq: SONC) cratered more than 10% after the company released a weak first-quarter earnings report and slashed its 2015 outlook. The company said it expects to open 22 to 27 franchises in its fiscal fourth quarter, which is well below its initial goal of 50 to 60 new franchises. Stocks to Watch No. 3, GOOG: Shares of Google Inc. (Nasdaq: GOOG, GOOGL) were up more than 0.4% after the tech giant announced plans to launch its own free music streaming service, expanding from its ad-free $9.99 model. The news comes just a week after rival Apple Inc. (Nasdaq: AAPL) announced plans to launch its own monthly paid streaming platform, Apple Music. Shares of AAPL stock fell 0.4% today. Stocks to Watch No. 4, FIT: Shares of Fitbit Inc. (NYSE: FIT) rose another 2% as shares continue to surge from its initial public offering last Thursday. The stock has nearly doubled in four days of trading, and its valuation has surpassed that of another company that once surged in a similar fashion: GoPro Inc. (Nasdaq: GPRO). Stocks to Watch No. 5, BBRY: Shares of BlackBerry Ltd. (Nasdaq: BBRY) slipped more than 4% on news that the company missed quarterly earnings estimates. However, the company said that it has seen stronger growth in its tech and software licensing business. Is BBRY stock dead money or a turnaround in the making? Find out here.